If you have music students who would be interested in attending any of our concerts, we would be pleased to facilitate ticket purchases for you and your students. Please contact our ticket manager Marion Perrin (780-920-2478 or marion@chamberorchestraofedmonton.ca) for advance ticket purchases at these reduced rates. Lidia Khaner has performed as Principal Oboe with the Edmonton Symphony Orchestra since 1996. She studied oboe in her native Poland at the Warsaw Academy of Music and graduated With Distinction in 1987. 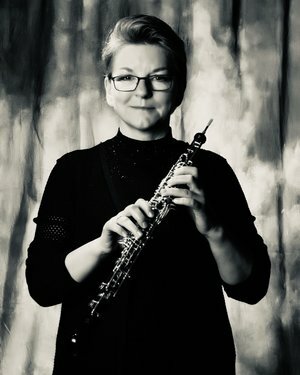 As a member of the Sinfonia Varsovia and the Polish Chamber Orchestra, she toured around the world playing both orchestral parts and solo concerts. During a sabbatical, she studied in Germany at the Stuttgart Hochschule für Musik with Ingo Goritzki, and played with the Deutsche Kammerakademie. Ms. Khaner played Principal Oboe with the Sinfonia Helvetica from 1992 to 1997. She has recorded works for the KOS label, the Polish radio and television network, CBC, and Arktos Recordings. Ms. Khaner has performed and recorded solo concerti with the Alberta Baroque Ensemble and soloed with the Red Deer Symphony, the Edmonton Symphony and the Edmonton Chamber Orchestras. She has been teaching oboe and chamber music at University of Alberta since 2002. She has released two CDs of oboe and piano music with Janet Scott Hoyt and also one of Mozart chamber music for oboe and strings. Her very latest release unites her once again with Janet Scott Hoyt in music by Schumann, Hindemith, Archer and McPherson and is now available on iTunes, Spotify and other popular music distributors. Ms. Khaner’s latest achievement is her Masters degree in Wind Band conducting from University of Alberta under Angela Schroeder. In addition she has been a participant in number of conducting workshops. studying with Wayne Toews, Dr. Robert Taylor, Dr. Mallory Thompson, Dr. Dale Lonis, Dr. Craig Kirchhoff, Dirk Brossé and John Farrer. Lidia is the founder and artistic director of Chamber Orchestra of Edmonton. 2019 "Affairs of the Heart"